On the morning of October 25, 1886 a train pulled into Pensacola, Florida. Onboard were 16 Apache men (in photo), some of their families and U.S. soldiers. Under guard, the Apache men were separated from their wives and children and forced onto a steamer for the short trip across Pensacola Bay to Fort Pickens. 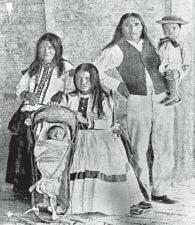 Their wives and children remained on the train and were taken to Fort Marion in St. Augustine, where 400 other Chiricahua and Warm Springs Apaches were imprisoned. Goyahkla, known as Geronimo, and Naiche, the youngest son of Cochise and hereditary chief of the Chiricahuas, were among the Apaches held at Fort Pickens until 1888. The Apache men were separated from their families, far from home and worried about the fate of their loved ones. of their land as well as their freedom. Bands of Apaches hostile to one another were forced together on the dwindling lands. They distrusted the American government due to broken promises. As conditions on the reservation worsened, some bands escaped. Among these was the band led by Geronimo, who after the loss of his mother, first wife and three children during a Mexican raid, became a fierce leader. Geronimo’s band raided across much of what is now New Mexico, Arizona, and northern Mexico, successfully evading 5,000 U.S. soldiers (about a quarter of the U.S. Army at the time), and 3,000 Mexican soldiers. In desperation, the U.S. Army hired about 500 Apache scouts to track hostile bands. Geronimo’s group was finally contacted by two of the Apache scouts and agreed to meet in Skeleton Canyon, Arizona territory where they negotiated with General Miles on September 3, 1886. Four days later, the entire Chiricahua tribe, including the former Apache Army scouts and Apaches who had stayed on the reservation, were put on trains and exiled to Florida where they were held as prisoners. guard Geronimo’s band at Fort Pickens. The editor of The Pensacolian noted Geronimo would be “an attraction which will bring here a great many visitors.” President Cleveland approved the petition for the Apache men only, separating them from their families and breaking another promise. stacking cannonballs. They were model prisoners who did not get into trouble or try to escape. The interpreter George Wratten reported to the guards that the Apaches “want to do what is required of them to the complete satisfaction of everyone.” He also reported that they longed to be reunited with their families, but felt the request would not be granted. Fearing public outcry, Colonel Langdon petitioned his superiors to support the Apache’s request. The families, including those of Geronimo and Naiche, arrived at Fort Pickens on April 27, 1887 and were housed in officers’ quarters on the south side of the fort. Single men were moved to similar rooms on the north side of the fort. Now the sounds of women singing and children playing could be heard in the fort. The newspapers reported “Geronimo Happy.” In June 1887, a corn dance was held in celebration of the families’ reunion. About 300 Pensacolians attended on invitation from Colonel Langdon. The families were now together, although without their freedom and in an unfamiliar land. joined the Apaches from Fort Marion who had previously been relocated there. The Apaches were moved a final time to a reservation of 50,000 acres at Fort Sill, Oklahoma in 1894. Geronimo died there in 1909, having never regained his freedom or returned to his homeland. The Chirichua Apaches were freed in 1913. Some chose to remain at Fort Sill while others including Naiche, the hereditary chief, went to live on the Mescalero Reservation in New Mexico. The Apaches fought with skill and courage against tremendous odds for their homeland and their freedom. Geronimo and Naiche became leaders of one of the last Native American groups to submit to the United States government. A variety of viewpoints exist about Geronimo’s group. 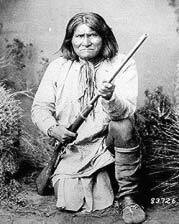 To some Apaches, Geronimo’s band embodied Apache values of aggressiveness and courage in the face of difficulty. Some Apaches who cooperated with the U. S. Army, such as the scouts and those who remained on the reservation condemned Geronimo and Naiche because they believed their actions caused harsher treatment on the reservations and ultimately resulted in their exile. To the settlers of Arizona, they were raiders and murderers. The Apaches’ exile and captivity eased their fears. To many Americans in the east, they were a tourist attraction. To the military, Geronimo was a great fighter who won the respect of many of the soldiers that pursued him. Today, this story of continued resistance against tremendous odds inspires thousands of visitors to Fort Pickens. As they discover more about the Apaches and their captivity, they learn the price of that resistance. The Apaches lost loved ones, their lands, their traditional ways of life, and for 27 years their freedom. The Apache population dropped 95% from 1850 to 1914. The few descendents of those who survived are proud to be called Apache. Many Restaurants: The Fish House, Al Fresco, Adonnas Bakery, Atlas, Jacksons Steakhouse, and more. Northwest Pensacola, Beulah, Bellview Area. 32502- Downtown Pensacola including S. Palafox Street to coastal areas.